Trouble sleeping? This post from last year is still relevant! Check out the TCMTalk video (at the end of the article too) for more, and if you'd like to try the WOOD element anointing oil blends mentioned (or any of the other elemental blends) they're on all sale for spring! The prescription for this kind of sleep trouble is to relieve and release the congested energy and emotions which are backing up and disrupting your sleep with mind-body-spirit practices that benefit the Wood Element and the Liver-Gallbladder system. 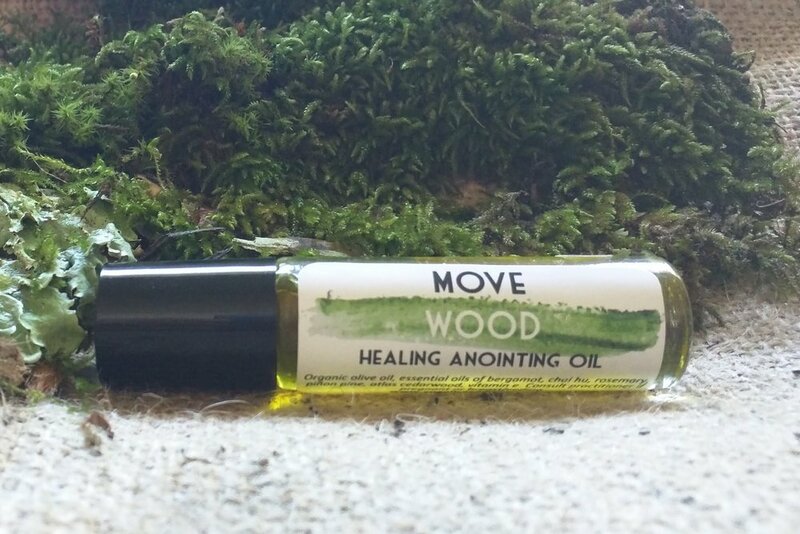 MOVE Wood Healing Anointing oil contains essential oils for relieving and releasing stuck energy and emotions. Massage especially for foot and leg massage, or the sides of the head - use an aromatherapy blend like Move Wood, Swimming Dragon oil, or make your own with the essential oils that harmonize and move stagnation in the Wood Element - Denise has a great infographic sharing some of our faves and how to use them. Herbs + foods: herbs that help move and benefit the Liver/Gallbladder and can relax you into a good night’s sleep include mint, lemon balm, cardamom, chamomile, and bupleurum or chai hu, (especially combined with peony root or bai shao) cumin, fennel and ginger. These aren't designed to knock you out, but rather help balance out your energy through the day - try drinking a spicy or minty blend in the afternoon. I like to add mimosa blossom or he huan hua, to my Swimming Dragon tea blend to relax and release the liver and promote sleep. Water with apple cider vinegar or lemon juice is a good morning beverage for folks suffering with liver congestion and stagnation. Try mixing equal parts (about a tablespoon each) of honey and apple cider vinegar into a big glass of water for a balancing sweet and sour health beverage to begin the day. Eating lots of veggies, whole foods and getting enough fiber also helps keep everything, including your stagnant energy, moving! Worry Journal - this is a way to help manage stress and worry: you write down everything that’s weighing on your mind so you can release it before sleep. It goes well with bedtime rituals and keeping screens and work out of the bedroom. You leave the day in the journal and enter into a different space/time for sleep and restoration. Meditation practice - meditation is something we recommend for every condition and stage of life! For when you’re feeling very pent up, try walking meditation. You can even do it if you awake in the night and can’t get back to sleep - get out of bed and do walking meditation for 10 or 15 minutes and then try to sleep again. The Wood Element and the Liver-Gall Bladder system are working hard in these times to cope with the onslaught of external stressors, environmental toxins and daily frustrations that we are all living with, especially those of us in oppressed and marginalized communities. Denise and I hope these ideas and strategies and everything we share through TCMTalk can support your wonderful body in harmony with the energies of the Universe and help you as you do your work in the world.